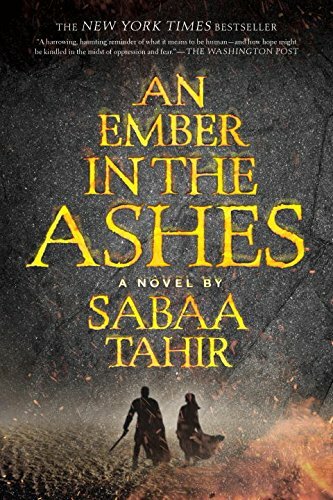 BOOK ONE IN THE NEW YORK TIMES BESTSELLING SERIES Instant New York Times bestseller From #1 New York Times bestselling author Sabaa Tahir Amazon's Best Young Adult Book of 2015 People's Choice Award winner - Favorite Fantasy Bustle's Best Young Adult Book of 2015 “This novel is a harrowing, haunting reminder of what it means to be human — and how hope might be kindled in the midst of oppression and fear.” — The Washington Post “An Ember in the Ashes could launch Sabaa Tahir into JK Rowling territory…It has the addictive quality of The Hunger Games combined with the fantasy of Harry Potter and the brutality of Game of Thrones.”—Public Radio International "An Ember in the Ashes glows, burns, and smolders—as beautiful and radiant as it is searing. "—Huffington Post “A worthy novel – and one as brave as its characters.” —The New York Times Book Review Laia is a slave. Elias is a soldier. Neither is free. Under the Martial Empire, defiance is met with death. Those who do not vow their blood and bodies to the Emperor risk the execution of their loved ones and the destruction of all they hold dear. It is in this brutal world, inspired by ancient Rome, that Laia lives with her grandparents and older brother. The family ekes out an existence in the Empire’s impoverished backstreets. They do not challenge the Empire. They’ve seen what happens to those who do. But when Laia’s brother is arrested for treason, Laia is forced to make a decision. In exchange for help from rebels who promise to rescue her brother, she will risk her life to spy for them from within the Empire’s greatest military academy. There, Laia meets Elias, the school’s finest soldier—and secretly, its most unwilling. Elias wants only to be free of the tyranny he’s being trained to enforce. He and Laia will soon realize that their destinies are intertwined—and that their choices will change the fate of the Empire itself.